Ottawa coach John Paddock says going undefeated should be every team's goal. Putting together the best quotes of the week is one of the fun parts of the job here at NHL World Headquarters. In scanning the Web daily to compile the best quotes, one never ceases to laugh, learn something and appreciate why hockey is a great game. Enough! On to the best of what’s being said around NHL rinks. 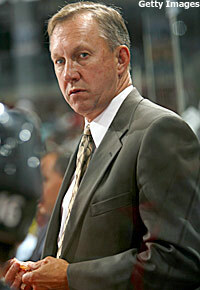 -- Senators coach John Paddock doesn’t sound like a coach off to the best start in NHL history, does he? "It doesn't feel good. I always try to stay positive, but today is a very dark day. I will have to go back to one of the doctors to see if there's something I can do. I'm not going to play if it's not working. I might as well retire." -- A disappointed Peter Forsberg after recurring foot and ankle woes forced him out of the Karjala Cup tournament. "We're not consistently doing that enough to be successful on an every-night basis. We are whatever we feel like that day, and that's just not winning hockey. If you want to be in the playoffs, you have to be a whole lot better than that. No team is going to give you an easy game and say; 'We'll just let you win tonight.' Especially with our team, we need everybody pulling their weight. That's the bottom line for us to win. If that's not happening, we can't blame anyone but ourselves. We're on the ice." -- Florida Panthers goalie Tomas Vokoun doesn’t mince words on his team’s inconsistent play. -- Columbus Blue Jackets coach Ken Hitchcock isn’t one for sideshows. "They talk about in Detroit; ‘You don’t play for the Red Wings until you become a man.’ And that’s why they are one of the older teams. They don’t rush their kids. They develop their kids. ... There is a process they go through and that’s something you want to emulate. It starts with their winning culture for the last decade and it doesn’t happen overnight. It is something that was built." 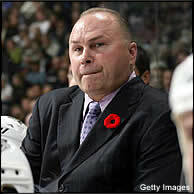 -- Nashville Predators coach Barry Trotz on the Red Wings and their winning ways. -- Flyers GM Paul Holmgren on coach John Stevens. -- Penguins coach Michel Therrien is in favor of “the more the merrier” approach to offense. -- Ducks coach Randy Carlyle sees plenty of room for improvement in Anaheim. "It's totally unacceptable. I will not accept that. That's not even close. That's the players' accountability to the front of that jersey. We've had a pretty good team in the last 3-4 games up until tonight. I know one issue and it will get resolved because it won't happen again. The best way to explain it is we've played a lot of games in a short period of time. We thought we'd give them a day off yesterday and I thought it affected us today. That's the players' responsibility to themselves and to each other to make sure you come to the rink ready for the game. Obviously they weren't. "I'm not going to sit here and sugar-coat it. Number one, it's unacceptable against whoever you play, but this was a big divisional game. I am surprised, to be quite honest." "As a hockey player you need to get up in the morning, start thinking about what you need to do, what kind of player you are and what you need to bring to the team that night. It’s a simple process. It might not kick in tomorrow but it has to kick in somewhere down the road here." 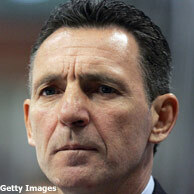 -- Blackhawks coach Denis Savard has very definitive ideas on how players should prepare mentally. -- New Jersey Devils coach Brent Sutter wasn’t sugar-coating anything after a 5-0 home shellacking against the Penguins Monday. "I don't know what to say. Going into the season everybody was talking about our offensive game. But we've been playing a really strict game, defensive hockey, smart hockey. The good part is it starts to pay off." -- Rangers goalie Henrik Lundqvist, who has been his team’s best player so far this season. "We get to find out where we fit in. It's pretty evident that the teams are good. Goals seem to be real hard to come by. The Leclaire kid in Columbus gets a shutout every night. I thought Nashville looked good winning three in a row. Chicago, I think, is impressive to watch. And then St. Louis has been real stingy ... so you go through the whole thing and it's scary." -- Red Wings coach Mike Babcock on the state of the Central Division. -- Oilers coach Craig MacTavish on Dustin Penner. "That's the reason why I'm here. He brought me to this country and drafted me No. 1. When he's behind the bench, it's a little bit special for me." 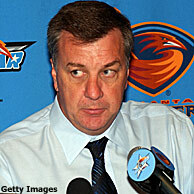 -- Thrashers winger Ilya Kovalchuk is more than a little loyal to Atlanta GM/coach Don Waddell. "It goes back to the first time he was in town (for an interview before the 2001 draft). I basically kidnapped him. He had his agent with him and I had one of our PR guys, and they went to the bathroom and I said; 'You take the agent; I'll take Kovy.' I've watched him grow up, not just as a player but as a person." -- Thrashers GM/coach Don Waddell on building a relationship with Ilya Kovalchuk. "I said this about a week ago, that we need to stop worrying about scoring goals and start worrying about winning hockey games. It lifted the pressure off of everybody. And all of a sudden our penalty killing took off, commitment to backchecking increased, our shot blocking improved and things worked out at the other end of the ice." “He’s such a great athlete. What I look at is a guy’s ability to skate, and he’s a really good skater. The foundation is his mobility, how athletic he is, how competitive he is. Everything is there. It’s just that sometimes a couple of things are going the wrong way and the next thing you know, everything doesn’t fit. -- Martin Brodeur’s scouting report on Pittsburgh’s Marc-Andre Fleury. "We are going to grow this franchise, and the more we grow this franchise, the bigger the fan base is going to be (and) more of the players will want to come and play for the Blackhawks. (GM) Dale (Tallon) and his on-ice folks have pledged to win the Stanley Cup, and that's certainly our goal, too, as far as ownership is concerned. We will not be satisfied until that day happens."